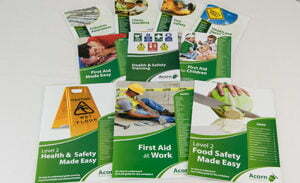 Acorn Health & Safety are a consultancy business that’s passionate about training. With over 60 different courses including a range of accredited programmes, bespoke courses and e-learning we’ve the right course for you and your staff. Acorn Health & Safety has, and always will be committed to supporting others in their development through participation face to face courses, toolbox talks and e-learning. Our course trainers all hold (or in a small number of cases are working toward) a recognised adult teaching and assessing qualification, very much enjoy spending time in the training environment and are great communicators. In addition our trainers are all competent in the subject matter they teach and hold a wide variety of professional health care, health and safety, first aid and manual handling qualifications. Most importantly they have experience, loads of it, practical hands on experience gained over years or in most cases, ‘doing’ that which they are now teaching others. Delegates attending our courses range from those who are comfortable in a learning environment to those who’ve not set in a ‘classroom’ for many years. We recognise this and employ a wide variety of teaching and training techniques and styles to engage, motivate and create an environment that is conducive to learning. We are committed to providing excellent customer service prior to, during and after your course. Our friendly team of administrators, trainers and consultants are on hand to answer any questions you might have at any time. We are accredited as a company by many national awarding bodies and our experienced team of specialist health and safety trainers and our professional first aid and clinical skills training team, are all individually accredited too. Click here to view details of our Accreditations and Memberships. Our Warmley training centre is located on the ground floor and if required parking spaces can be reserved directly outside the entrance. There is an accessible toilet. How do we approach health and safety training? You can book an open course over the phone during office hours or on-line for greater convenience. Simply browse our calendar of forthcoming course dates, choose the course you’d like to take and follow the on-screen instructions. If you are booking on-line for the first time a new user account will be created for you automatically and your login details will be e-mailed to you for faster checkout next time. We specialise in providing in-house training courses, delivered at your premises or other appropriate venue at a time convenient to your business causing as little disruption as possible to the schedules of your staff. In most cases in-house training becomes an incredibly cost effective option if you’ve over six staff members looking to attend. Training In-house reduces ‘down’ time, is often more convenient for staff, saves travelling elsewhere and in most cases can take into account local policies, procedures and practice. If you are considering training please contact us, we’re always happy to discuss ideas and come up with the right training solution for you and your business. At Acorn Health and Safety, we have developed an enviable reputation as a provider of tailored (bespoke) training designed to meet the often varied and individual needs of our customers, their staff teams and organisations. Tailored training offers a number of benefits. It’s an extremely cost effective solution and it also meets your specific training and development needs, in addition to providing evidence of compliance with statutory duties. Our innovative, modular approach allows you to group together a number of training and development activities over a set period of time. As each course is tailor made to the needs of your organisation our trainers will ensure your relevant information is included, for example by making reference to local health and safety policy documentation. These courses benefit both organisations seeking to provide initial training for staff members and are equally suited to those wishing to refresh, update or further develop their staff teams. We have consciously chosen a provider whose courses all have external accreditation by nationally recognised organisations, such as the FPA, LCA, ROSPA, and IATP and we like the fact that the training is presented using a blended approach. E-learning can complement face to face training. For example, a trade business may opt for a face-to-face Asbestos Training session initially and then refresh those skills in year two by using an e-learning training course. Attending a health and safety course that’s delivered in a relaxed yet informative style allowing delegates to develop new skills and knowledge and confidence in current practices and procedures, helping you to remain legally compliant and, protect your business, employees, and property. Employees and stakeholders benefit through, the prevention and management of accidents which, protects your business both financially and legally. Our clinical skills and first aid courses provides the necessary theoretical knowledge and practical hands on skills, ensuring confidence when dealing with a medical emergency. From helping someone that has injured themselves, through to CPR, candidates gain lifesaving skills that we believe everyone should have. Our accredited professional trainers, many of which are registered nurses, provide practical lifesaving experience, that can be used in the street, at work, or in a health care environment. We recognise that e-learning is a cost-effective training method. Our e-learning platform is available 24 hours a day, 365 days a year and therefore accessible when you or your staff team need it. First Aid Training – Why choose us?